There’s not much to be said about this movie that either hasn’t already been said or wouldn’t be assumed by Harry Potter fans. It’s a long movie. They leave stuff from the book out and add a couple of scenes in. The CGI is fantastic. It’s a lot darker than the movies before it. But you knew all that. I enjoyed the movie, but not with the usual level of joy and excitement I have when seeing a Harry Potter film. This movie marks a very dark turn for the story, and it’s hard to get that tingly, magical feeling from it when terrible things are happening on screen. Half-Blood Prince finds Harry fresh out of battle with Voldemort’s Death Eaters. Bellatrix Lestrange has killed Harry’s only version of family, his godfather Sirius Black. Voldemort is returning to power and wreaking havoc on both the wizarding world and the Muggle one. Harry’s greatest ally, Professor Dumbledore, asks Harry for help once again. Now, more than ever before, Dumbledore needs Harry to help defeat Voldemort. In the midst of all this, Harry, Ron, & Hermione are going through the usual teenage issues. Dating and jealousy feature more prominently than in past films. Some foreshadowing of their eventual romantic leanings occurs. 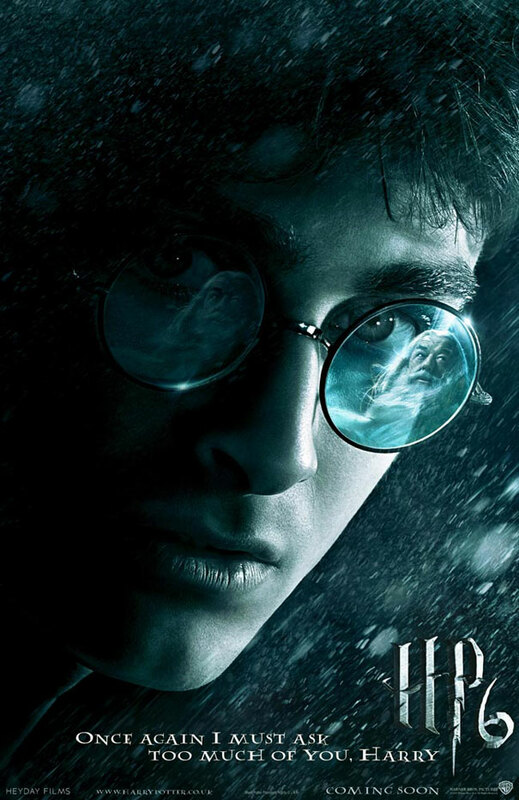 Harry learns more about Voldemort’s rise to power, including his start as a young orphan “different” from the others, being invited to Hogwarts. Harry has to learn more about Voldemort’s past in order to help Dumbledore defeat him. The movie is well done, although it has been quite a while since I read the novel, so I might not be as picky about it as other Potter fans. It felt, more so than the other films, like a setup for the next one. I felt similarly about the novel – Half-Blood Prince is an interesting story, but has less of a solid resolution than the other installments. It feels less like a standalone story and more like a stepping stone. However, I expected that, having read the novels. The highlight of the film, for me, was watching the young actors handle the darker material. In the first film, the trio of lead characters were cute kids, kind of precocious, and looked just right for the part. Over the years, however, they have truly grown into themselves as actors. Emma Watson, Rupert Grint, Daniel Radcliffe, and Bonnie Wright (the actress who plays Ginny Weasley, who joins the lead characters to make it a quartet) show in this film that they can handle the dark, nuanced acting required of them in the final two films. I have a feeling they will have little trouble shedding their Harry Potter typecasts should they choose to do so. Also worth noting, Tom Felton (Draco Malfoy) has also grown into his role nicely. He’s changed from the snot-nosed little brat that tries to steer Harry away from “the wrong sort” in Sorcerer’s Stone into a confused and manipulated young man. I definitely recommend checking the movie out on the big screen. The special effects never disappoint. While it’s less of a cheery adventure tale than the previous films, it’s definitely worth seeing. Some folks are still mad that Harry Potter and the Half Blood Prince didn’t come out back in November, when it was supposed to. I’m indifferent. I wasn’t heartbroken when they pushed it back to July. A lot of you were, though, and that’s fine. Warner Brothers announced this morning that they were pushing the release date up by two days, from Friday July 17th, 2009, to Wednesday July 15th, 2009. Order of the Phoenix also released mid week, and earned about $160 million in the first five days. It’s a sure bet that this one will pull in the same cash, if not more. The new trailer for Harry Potter and the Half Blood Prince will hit television tomorrow night at 9PM Eastern, presumably right before “The Office” starts, because let’s face it that’s the only thing people watch at 9PM on Thursdays. The new Harry Potter Flick has a new, full length trailer out today. Check it out below. I haven’t watched it yet, mainly because I’m not all that interested. Warner Brothers announced some release dates that people were curious about, so I thought I’d share them with you all. USA Today online has a new article with images from Harry Potter and the Half-Blood Prince. The first image reveals the young Tom Riddle, who grows up to be Voldemort. In an interesting bit of casting, the young Tom Riddle is played by Hero Fiennes-Tiffin, the nephew of Ralph Fiennes, who plays Voldemort. From the image (seen below), it looks like young Hero is destined for a life of playing villains. He has a dark intensity most 11-year-olds don’t have. You can read the whole article, and check out another picture of Dumbledore, on USAToday.com.